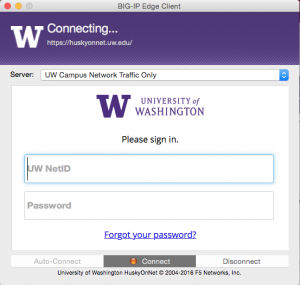 Husky OnNet is the branded name of the UW VPN service provided by UW-IT that uses the F5 BIG-IP Edge applications. Learn more about Husky OnNet. Husky OnNet for MacOS, Microsoft Windows and Linux: Available free for UW students, faculty and staff via download from UWare. Husky OnNet for mobile: F5 BIG-IP Edge applications (client) apps are also available for tablets and other devices (e.g., Android, iOS, ChromeOS) from the respective app store (Google Play Store, iTunes, Chrome Web Store). Download and install the Husky OnNet client software. Find and run the Husky OnNet software to finish installation. Test your connection via the Husky OnNet test server. Note: If you’ve followed these instructions but still aren’t able to get to the resource you are trying to access, please see Special Uses. First, review the Terms and Conditions for Husky OnNet. If you agree to the term and conditions, click “I agree” at the bottom of the webpage to proceed to download Husky OnNet. The application will open. Enter your UW NetID credentials. To activate Husky OnNet, click Connect. When asked, enter the appropriate username and password. Note: When the MacOS application opens, you will see a screen showing three options: Auto-Connect, Connect, Disconnect. The Auto-Connect feature is permanently DISABLED and does not work. To start your Husky OnNet session, click Connect. To end your session, click Disconnect. Always be sure to click Disconnect before attempting to start another session. 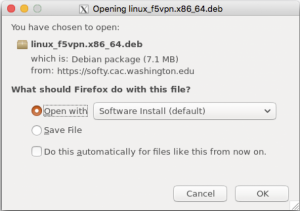 The f5 Helper Application is designed to be self-installing and self-configuring, but F5 recommends using Firefox to install the f5vpn software on Linux systems. A pop-up window showing your session status will appear. You can minimize this window and remain connected, but closing this window or browser completely will terminate your VPN session. 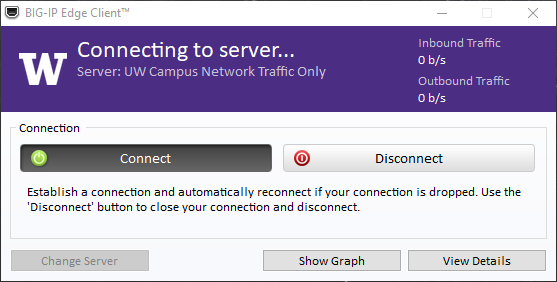 To disconnect from Husky OnNet, click “Disconnect” button in the upper right corner of the pop-up browser window. From the Server pull down menu, click Add New Server. Click Add and Connect. This adds the server address as the new server in your server list and takes you to the authentication login screen. Log in and let the system connect. The system should repopulate the original server name(s) into the server pulldown menu list. On the main console, click Change Server. Select and clear out the current server. To add the server address as the new server in the list, click Next. To confirm, click Change Server again. You should see the server name in the server pulldown menu list. To access the server, select it and click Connect. 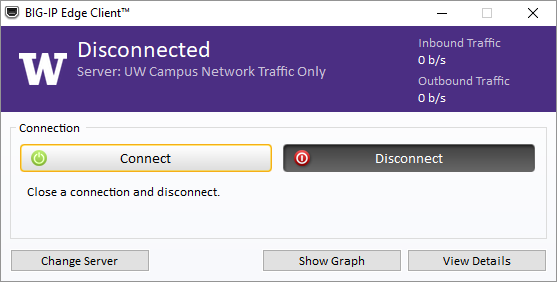 If you have successfully installed and connected to the UW network with Husky OnNet, you will see a “Congratulations!” message. In the Control Panel, go to Programs and Features. Select all BIG-IP components and click Uninstall. _Common_huskyonnet-split_na_res – Go to huskyonnet.uw.edu instead of dialing directly. Open the Husky OnNet BIG-IP Edge Client application. From either the f5 dock icon (right click for menu) or f5 status bar icon (click for pulldown menu), select Preferences. At the top of the Preferences window, next to General, select Advanced. You will see an uninstall option for two components. Click ONLY the uninstall button for the BIG-IP Edge Client. 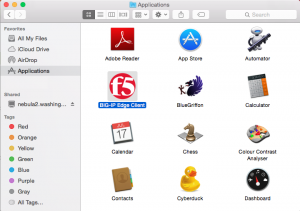 This will remove all the application components from your machine. Note: There is no SSL VPN Plugin installed with Husky OnNet; selecting uninstall for this component may hang the application, requiring you to quit and restart the application. Use the package manager native to your Linux distribution (for example apt, zypper, dnf, or yum) to remove f5vpn (the f5 VPN application). 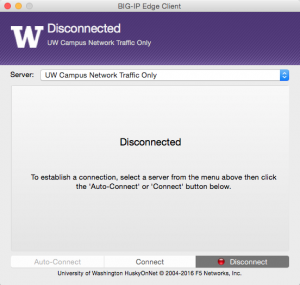 Some UW network users require access to network resources and applications that reside outside the UW network but access to those resources is allowed ONLY to devices that are members of the UW network (i.e., have a UW IP address). To end your current session, click Disconnect. From the drop-down menu, click All Internet Traffic. To begin a new session on the new server, click Connect. 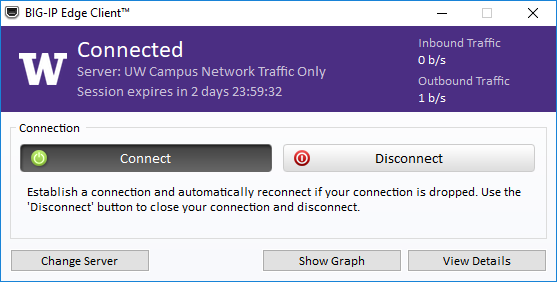 When using this option, all of your traffic is using the Husky OnNet connection, and is subject to the UW Appropriate Use policy. 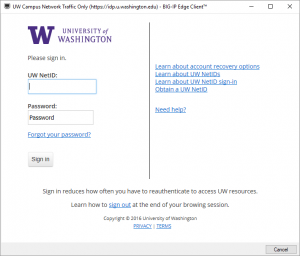 Note: Access to UW-restricted library resources is supported only for current UW faculty, students, staff using the general Husky OnNet services and the “All Internet Traffic” server. Those connecting with Husky OnNet-Department (HON-D), including affiliates users with sponsored UW NetIDs, will not have access to restricted library resources.